A man has been charged with murder after a man was stabbed in the stomach, police said. Paramedics found who they believe to be Phillip Rooney, 32, at a property on Platt Street in Leigh at about 23:45 GMT on Saturday. 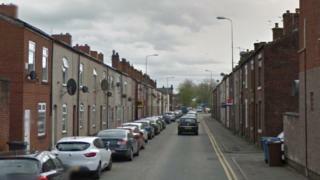 He was unresponsive and pronounced dead at the scene, Greater Manchester Police said. Stephen Brocklehurst, 48, of Billinge Road, Wigan has been remanded to appear before Wigan Magistrates' Court later.